One of the possible issues while running apps or booting Windows 7, 8 or 10 is an error message .NET Framework Initialization Error. To run this application, you first must install one of the following versions of .NET Framework. 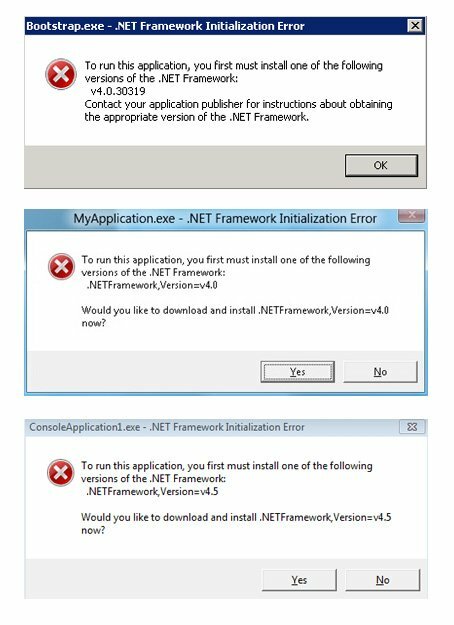 This error can occur in case you don’t have the needed .NET Framework version installed on your computer or you have some issues with the installed features. In this article we will take a closer look on all known solutions to fix .NET Framework Initialization Error in the latest Windows versions. How to Fix Framework Initialization Error in Windows? Important! We are using .NET Framework 4.7 while performing these instructions. It doesn’t matter which version is mentioned in error message, the latest version will help to fix all of the issues. The first solution you need to try is to delete all .NET Framework features on your Windows machine and re-install them again. After deleting, reboot your computer. 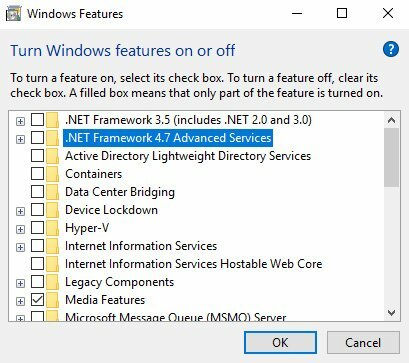 Now go to Programs and Features again, check on .NET Framework 4.7 or 4.6, confirm the installation and after the process finishes – reboot your computer again. Download and install the latest version of .NET Framework 4.7 from the official Microsoft website. After installation and rebooting the computer, check if the NET Framework Initialization error still occurs. On next step you will see a list of possible issues with .NET Framework different versions. Click Next to run repair (it can take a some time). After you have finished with the utility, we recommend you to reboot your computer and then check if the NET Framework error still persist. The next utility is .NET Framework Setup Verification Tool. It allows you to check if all of the features of .NET Framework are compatible with the version that is used on Windows 10, 8 or Windows 7. After the utility runs, choose the version of .NET Framework which you want to check and click on Verify Now. After the check finished, the text value in a field Current Status will refresh. You can download .NET Framework Setup Verification Tool from official MS website (you can find downloading options in Download location section). 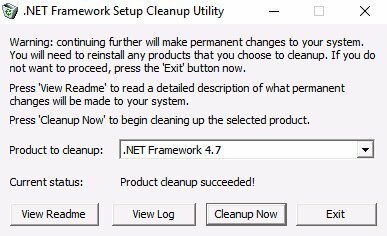 One more great utility to fix NET Framework Initialization Error is .NET Framework Cleanup Tool, you can download it here (go to section Download location). It allows you to fully remove all chosen versions of .NET Framework from your computer, and then re-install it again. It’s important to mention that the utility doesn’t delete features that are an integrated Windows part. For example, you can’t delete .NET Framework 4.7 in Windows 10 Creators Update with the help of this utility, but it will definitely solve the NET Framework error in Windows 7 by deleting .NET Framework 4.x versions in Cleanup Tool and further re-installation of the latest version from official website. Tip. 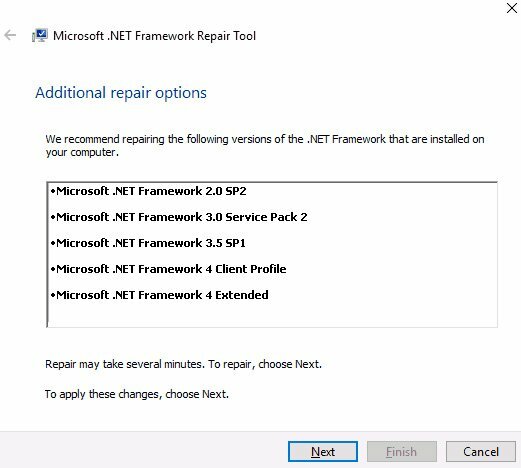 Sometimes simple re-installation of the application that causes the issue solves the NET Framework Initialization error! 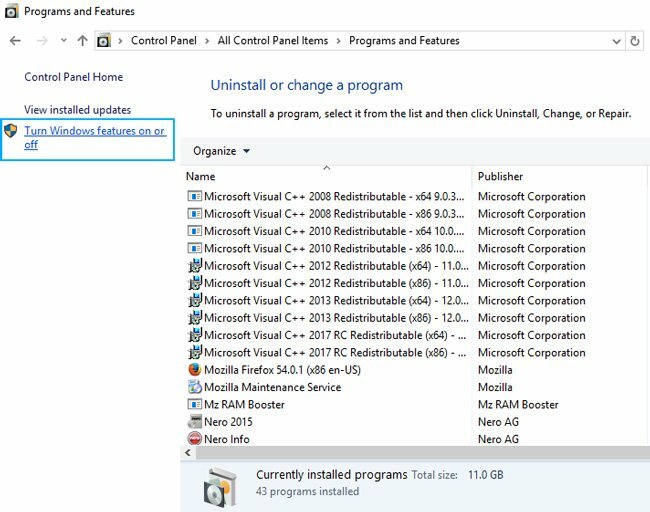 In case you are facing with the error during Windows boot (it means that this application is set to automatically start whenever Windows boots), you can remove this app from startup list if it’s not so important.